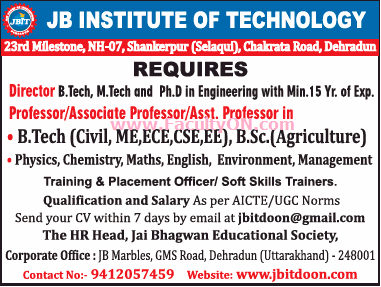 JB Institute of Technology, Dehradun has advertised in THE TIMES OF INDIA newspaper for the recruitment of Professor / Associate Professor / Assistant Professor / Director jobs vacancies. Interested and eligible job aspirants are requested to apply within 07 days from 11th July 2018. Check out further more details below. College Profile: JB Institute of Technology, Dehradun was established in 2009. JBIT has turned out to be one of the premier private engineering college of Uttarakhand. The 25-acre campus of JBIT, located at foothills of Himalaya is home to a large number of students coming from different states of India. JBIT has emerged as the beacon of innovative Engineering Educational College among the best Engineering Colleges in Dehradun. Qualifications: As per AICTE / UGC norms. Salary: As per AICTE / UGC norms. How to Apply: Interested and eligible candidates are requested to send application along with CV, copies of certificates and recent PP size photo to the following email address.